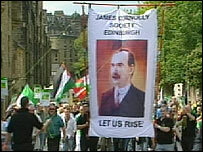 About 800 people have taken part in the annual James Connolly march through the centre of Edinburgh. The event ended with a rally in the capital's King Stables Road on Saturday afternoon. The procession commemorates the life of the socialist and Irish Republican, who was born in Edinburgh in 1868, the son of Irish parents. Connolly was court-martialled and then executed for his part in the Easter Uprising in Dublin in 1916. # posted by SAOIRSE32 : 10:23 p.m.